We at ADITYA ENTERPRISE supply 100 % Replacement, Compatible and OEM Quality Gears and Gear Sets of ATLAS COPCO, CHICAGO PNEUMATIC etc Make Rotary Screw Compressors. We at ADITYA ENTERPRISE are pioneer supplier of 100% Replacement and Compatible Gears and Gear sets for Atlas copco, Chicago Pneumatic , Ingersoll Rand screw compressors at very much competitive price and OEM Quality. With the endorsement of our adept and seasoned professionals, we are engaged in offering a commendable range of Gears / Gear Set for Atlas Copco Screw Compressors. 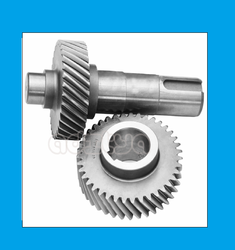 The offered gear set is manufactured by making use of best grade raw material and leading technology in synchronization with the set industrial standards. In line with clients' variegated needs, we offer the entire range in different customized options. Clients can avail the entire range from us at industrial leading prices. 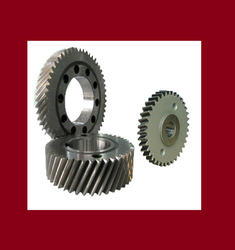 With the endorsement of our adept and seasoned professionals, we are engaged in offering a commendable range of replacement Gears / Gear Set for Chicago Pneumatic Screw Compressors. 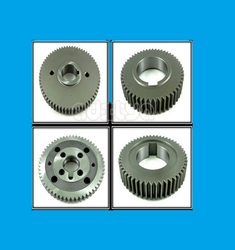 The offered gear set is manufactured by making use of best grade raw material and leading technology in synchronization with the set industrial standards. In line with clients' variegated needs, we offer the entire range in different customized options. Clients can avail the entire range from us at industrial leading prices. 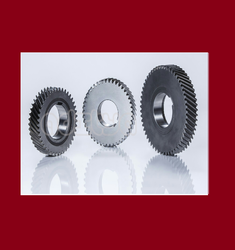 With sincere intentions to preserve and uplift our reputation in the market, we bring forth a distinguished assortment of Rotary Screw Compressor Gear Set. Our offered set is manufactured using best-grade raw material and latest technology in conformity with definite quality standards. The offered range is used in various industrial compressors. Keeping in mind the diverse requirements of our clients, we provide the entire range in various sizes and designs and at affordable prices. 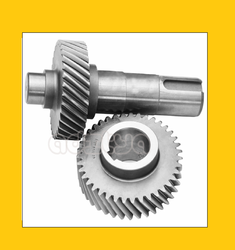 Air Compressor Model ga,ml,mm,xf,cpa,cpb,cpc,cpd etc..
With sincere intentions to preserve and uplift our reputation in the market, we bring forth a distinguished assortment of Rotary Gears. Our offered set is manufactured using best-grade raw material and latest technology in conformity with definite quality standards. The offered range is used in various industrial compressors. Keeping in mind the diverse requirements of our clients, we provide the entire range in various sizes and designs and at affordable prices. We are pioneer supplier of 100% Replacement and Compatible Screw compressor Gears and Gear sets for Atlas copco, Chicago Pneumatic , Ingersoll Rand screw compressors at very much competitive price and OEM Quality.